Suspected state agents yesterday, January 8, 2019 attempted to invade Crisis in Zimbabwe Coalition (CiZC) offices around 1600 hours. 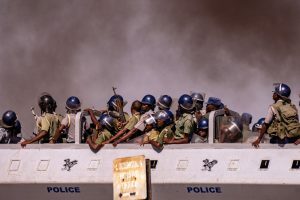 File Pic: A police truck drives past a thick cloud of smoke as protesters burn tires in Bulawayo, Zimbabwe, during a tense, three-day nationwide protest against a fuel price hike in January. At the time they arrived, the secretariat was not at the office. According to eyewitnesses, 4 men and 2 women clad in civilian clothes came and enquired the whereabouts of the secretariat (whom they labelled as criminals) from neighbours who professed ignorance over the matter. They then proceeded to take pictures and videos at the premises after which they left promising to come back. The recent event follows threats by a shadowy organization, the Citizen Forum which has threatened to besiege CiZC offices on the grounds that the pro-democracy group is allegedly pushing a regime change agenda. At a press briefing, the group alleges that it submitted petitions to the Zimbabwe Lawyers for Human Rights on why they are representing people accused of participating in protests between 14 and 16 January 2019. We suspect that the citizen forum is a surrogate formation of the ruling elite which was established to push the government’s agenda to clampdown on civic society in the country. Don’t worry, your weakness is the required ingredient for your success!